The HyStem® Hydrogel UV QuickSet Kit supports 3D cell culture for use in tissue engineering and small scale bioprinting applications. 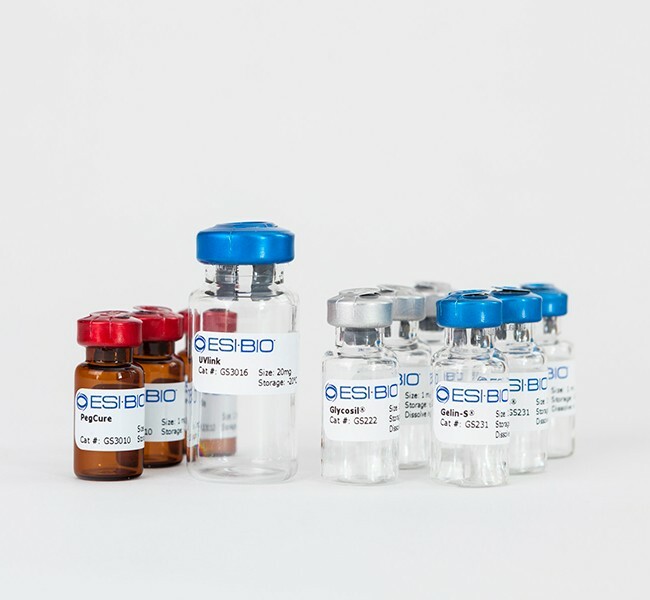 As one of the first hyaluronic acid-based light-controlled hydrogels, the HyStem® Hydrogel UV QuickSet Kit supports 3D cell culture for use in tissue engineering and small scale bioprinting applications. The HyStem® Hydrogel UV QuickSet Kit provides increased temporal and spatial control making it ideal for micro-scale bioprinting. Gelation occurs after 30-60 seconds when exposed to ultraviolet light as compared to ~30 minutes using other hydrogel formulations. The HyStem® UV QuickSet kit is composed of HyStem (thiol-modified hyaluronic acid), Gelin-S® (thiol-modified gelatin), UVlink™ (PEG-norbornene), Irgacure 2959 for photoinitiation, and DG water. A transparent hydrogel forms when contents are mixed and exposed to UV light. All vials are packaged as sterile lyophilized solids that are blanketed by argon and under a slight vacuum. Hynes, W.F., et al. (2014) Micropatterning of 3D Microenvironments for Living Biosensor Applications. Biosensors 4, 28-44. PMID: 24791214.